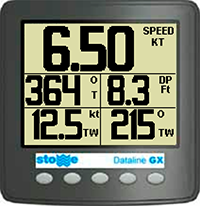 The USCG publishes a 6 volume list of all the navigation marks, buoys, day marks, etc. that are in US waters. This list is updated each week. L-36.com now has an updated application that allows you to select an area on a map, check marks of interest in that area, and create gpx files of the waypoints as well as any routes you might want to create. You can see your marks on a map to help verify you have the right ones. Using free android apps, you can use your phone when there is no wifi network to log onto your embedded processor such as the StartLine RaceBox. You can also transfer files to your phone and then send them via email to anyone. This is great on a boat where there is typically no wi-fi network. There are lots of ways to tie a bowline. I think this is the quickest, fastest, easiest to do and remember of all the ways. I learned this when I was a kid from my dad. He probably learned it in the navy in WW II, not sure. But I do know he was a sailor and knew how to tie a bowline fast. Introduction videos to the StartLine RaceBox. 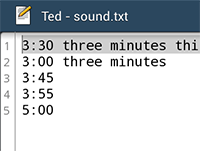 There is an introduction of about 6 minutes, a longer video that includes a demonstration of some of the features including how to download log files over WiFi. There is also a link to the Bluetooth GPS Provider article. 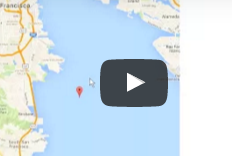 This article shows how to modify an Android application that uses internal GPS and external nmea data and add gps over nmea. It also explains how to take that app and use it. The secret is using the plug in feature of Bluetooth GPS Provider and adding their Plugin code to the build stack of the Android app along with some simple changes to the target app. 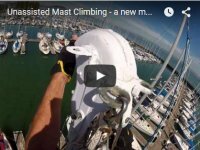 Some time ago I published THIS article on mast climbing. I reviewed 5 methods including two rock climbing techniques I modified for mast climbing. Of those there were two that I have tried extensively. One used a GriGri and it had real problems. I published an update on that HERE that solved the worst of those problems but still left some. Since then, I have tried both and conclusively settled on the one I called the Modified Technique. It is shown in the video below, which is approaching 30,000 views on YouTube. This update explains why I picked the system I am now using, how to make it, and how to use it. NEW StartLine4 now has a Pebble app? Just search StartLine in the Pebble app store. L-36.com Race Box that can be easioly built with $100 to 200 in parts depending on how fancy you want to get. Contact me for details. You don't even need to know how to solder! StartLine is a very powerful racing app, second only to Expedition. Unlike Expedition, it is free. However, I limit the number users because along with the app comes a huge amount of support both to get the full potential out of the app but also to help users improve users race results. Users must agree to contribute to the StartLine community by providing feedback on results or actually participating in the ongoing development which may just be to ask for new features. You must be serious about racing and commit to put in the time to learn the app. It will improve your race results as it has for the other users. It is a small community but already has a podium finish in a prestigious regatta. Read this somewhat outdated manual below and let me know if you are interested in joining the StartLine team. It has been a year since I wrote the knives on a boat review. It was really a review mostly of every day carny or EDC knives with one specifically marine knife with a marlin spike. I have lived with these knives and find my favorites to be a little different than my first impressions. I still like all these knives very much but the question is, which ones do I end up using and what do I use them for. For this review, I have added short 15 second videos of the knives opening and closing so you can get a better picture of how they work. I also added a discussion on two knives I bought recently. One I returned the same day and the other I am not really sure what I am going to do with but it is so nice I just had to get it. It is a knife I have coveted since the first time I saw someone with one. In the article on Unassisted Mast Climbing I prefer the modified method but mention that the GriGri method is easier to use. 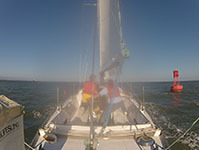 There are two things I did not like about the GriGri method 1) It requires re-rigging the setup at the top of the mast. That is really a most unpleasant experience. 2) The descent, while quick and easy, it jerky and can be frightening and if you panic, can be really scary. I have developed a new method for the re-rigging and descent that solves the second complaint but you still need to do the re-rigging. This article presents that technique and reviews the GriGri method. Seemed like a simple enough project to paint the deck on my boat. Add some non-skid and repair several years of little cracks where the old non-skid was coming off. It turned into the project from hell when the masking tape pulled off the paint below. In spots it did not pull anything off. In spots it pulled off my fresh paint. In other spots it pulled off 10 years of paint leaving rather deep ridges. In one spot it pulled off all the paint, 60 years worth, all the way to the base cloth. This was a low stick tape. It was not as low stick as the tape I once used so I started looking for more of that tape. I could not find it but I did find a list of tapes and how sticky they are. This is not very easy to find so I thought I would share the results of the several hours I spent online finding this information. 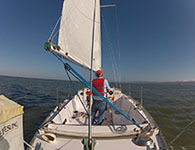 The promise of videos of my sailing was too good to pass up so I bought a GoPro Hero 2 shortly after they came out. I did get some good videos but all too often the images that came back would be fogged up. It got to the point that I just didn't want to bother to put the camera on the boat because I knew the videos would be fogged. I tried many things to prevent this but nothing worked until this last time.